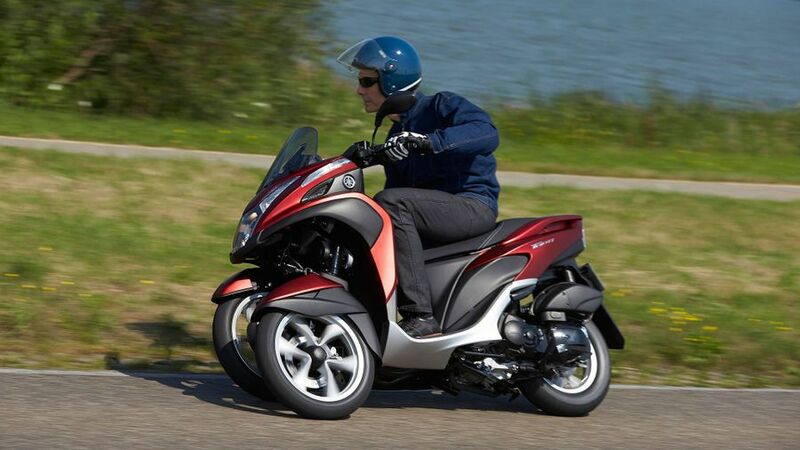 Interested in buying a Yamaha Tricity? 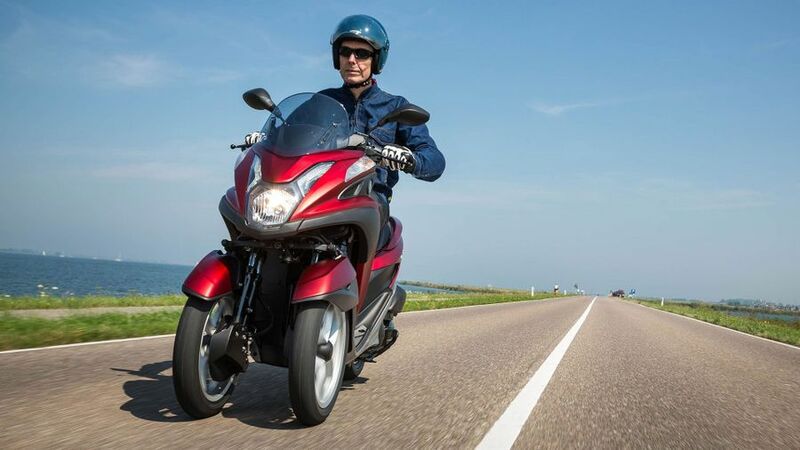 The Tricity follows Piaggio’s pioneering MP3 by using a parallelogram-style linkage for its twin front wheels but its design avoids the Italian firm’s patents. Yamaha’s system is narrower and uses telescopics instead of a leading link design. (The wheels are 385mm apart, compared to the 465mm of Piaggio’s LT models, so the Tricity can’t be ridden on a car licence.) Each front wheel has two 33mm diameter fork legs, one behind the other. One leg on each side is a normal suspension unit with a spring and damping; the other is hollow, and there essentially to prevent twisting. The Tricity has a typical scooter’s upright riding position. It’s compact, with a short 1,310mm wheelbase and low 780mm seat height, but roomy enough that I didn’t find it cramped, despite being very tall. There’s a small screen, and fairly generous weather protection for the rider’s legs, with just enough room for my knees. There’s no MP3-style tilt lock, but the scooter’s light weight and the low seat made it easy to handle at a standstill. 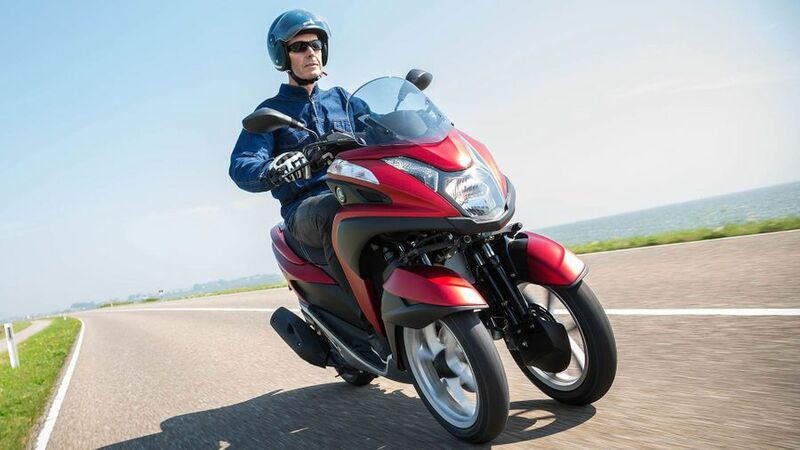 At just 152kg wet, the Tricity is 17kg lighter than Yamaha’s conventional X-Max 125 scooter despite having an extra wheel. There’s not much to complain about here. The Tricity’s slimness and reasonable amount of steering lock means that it’s pretty much as manoeuvrable in traffic as any other scooter or bike, despite is extra wheel. There’s room for two, even though it’s quite small and has only a 125cc engine, with retractable pillion footrests and solid hand-holds under the seat. The seat hinges to reveal room for a full-face helmet, so more storage space than some scooters provide, if less than others. Fuel capacity is only 6.6 litres but should still give a range of close to 150 miles, adequate for a small-capacity scooter. Engine performance is adequate rather than outstanding. The Tricity’s sohc, liquid-cooled single-cylinder lump is less powerful and expensive than the unit that powers some 125cc Yamahas including the MT-125 and X-Max 125. It has two instead of four valves, and produces a maximum of 11bhp at 9,000rpm, rather than the A1 limit of 15bhp. It’s a pleasantly refined powerplant with a glitch-free injection system and a similarly efficient CVT transmission system that makes pulling away as simple as twisting the throttle. The Tricity is designed mainly for town use and works well there, having enough performance to accelerate away from the lights ahead of most traffic. It’s fine on the open road, staying pleasantly smooth all the way to a top speed of about 70mph. But the Tricity takes a while to get to 60mph, even on a still day. Being overtaken by a stream of lorries and cars while holding the Tricity flat out into a headwind on busy main road is not an appealing prospect. Braking power is excellent, thanks mainly to the 220mm disc on each of the Tricity’s front wheels, and aided by the Yam’s light weight. Squeezing the left handlebar lever operates front and rear discs, and can match most scooters’ stopping power on its own. The right lever adds more front brake, allowing fierce stopping, with the benefit of high levels of front tyre grip and skid resistance. There’s a slight pulse through the right lever when you use both; and there’s no ABS, which would be useful in the wet. But overall, it’s an outstanding system. 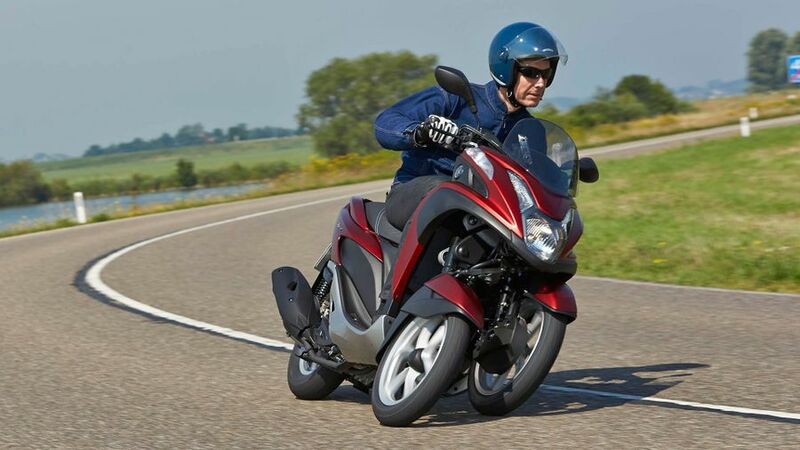 A three-wheeled scooter’s theoretical advantage is its increased stability, and the Tricity manages to add that benefit while also having light and reassuringly accurate steering. Direction changes require a slightly more deliberate movement of the moderately wide handlebar than with a normal scooter of similar weight, but the steering is very neutral, and changing line is easy. And the Yamaha remains untroubled by the road surface irregularities that can cause a problem for ordinary scooters, especially ones with front wheels smaller than the 14-inch diameter of the Tricity’s pair. Its biggest advantage is likely to be on roads made slippery by rain or hazards such as drain covers or fallen leaves. It should also be outstanding in the wet, even though its Taiwanese-made Maxxis front tyres are narrow (90-section) and closer together than an MP3’s. Dry weather on the launch in Amsterdam meant I couldn’t test that but I was very impressed by the Tricity’s ability to cope with even quite large obstacles, as the parallelogram system allowed much more movement from one front wheel than the 90mm of fork travel would suggest. The simple twin-shock rear end can feel harsh over bigger bumps but the thick seat means the ride is still reasonably comfortable. Inevitably, owners will have the additional cost of an extra tyre and brake pads every so often, but that would seem a small price to pay for the three-wheeler’s stability benefits. In most respects the Tricity will be like any other softly tuned 125cc scooter to run. In normal use, it should return 70- to 100mpg. It’s too soon to comment on reliability with any accuracy but Yamaha have been building 125cc scooters for a long time and there’s no reason to expect the Tricity not to be up to standard. Service intervals are 600 miles then every 2,400 miles, and the drive belt needs changing every 12,000 miles, which should keep most owners going for a while. The telescopic front suspension system is essentially simple so shouldn’t involve extra cost. 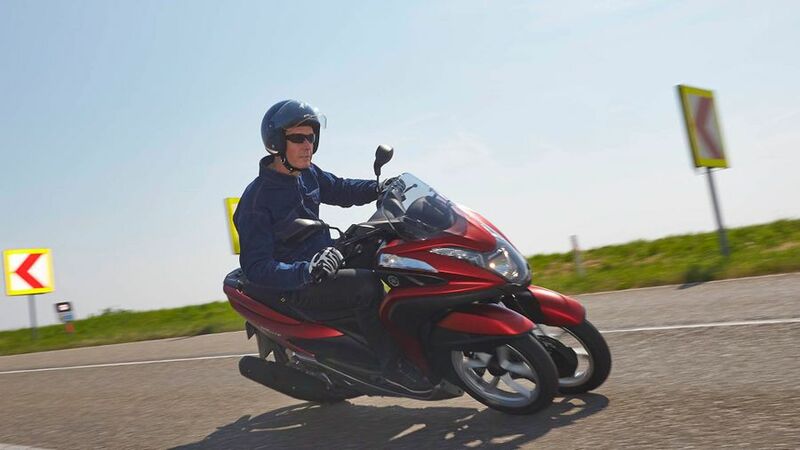 Like all the firm’s machines above 51cc the Tricity comes with a two-year, unlimited mileage warranty. You don’t expect too much equipment from a 125cc scooter, but the Tricity has a fairly large and easily-to-read digital instrument panel that incorporates a fuel gauge, clock and ambient temperature indicator. 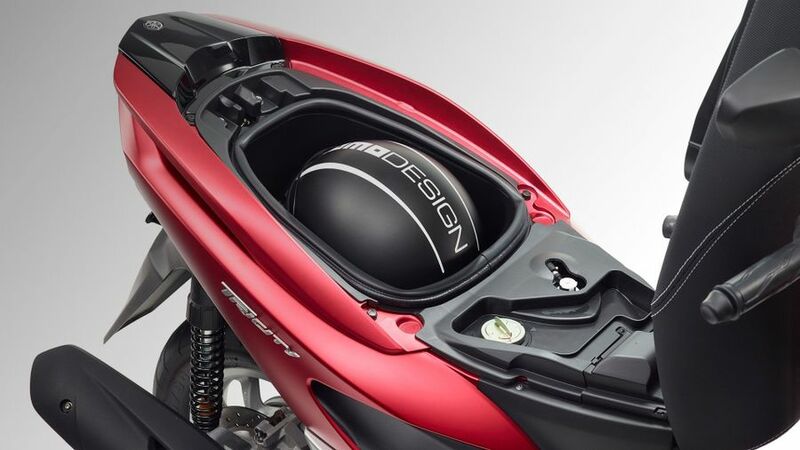 A luggage hook complements the 20 litres of under-seat storage. The mirrors are too narrow to give wider riders a clear view behind, but other detailing is good. Quality of finish also seems well up to standard, with a choice of four colours: red, white, grey and black. The Tricity is built in Thailand rather than Japan, which contributes to its very competitive price, but there was no evidence that this has resulted in a drop in quality levels. There’s a good selection of accessories, including taller screen, sports screen, hand protectors, heated grips, comfort seat and backrest. Some people might still have reservations about three-wheeled scooters but that attitude is likely to change as they become more popular. It certainly has done already in the French fashion capital of Paris, which is crawling with Piaggio MP3s. 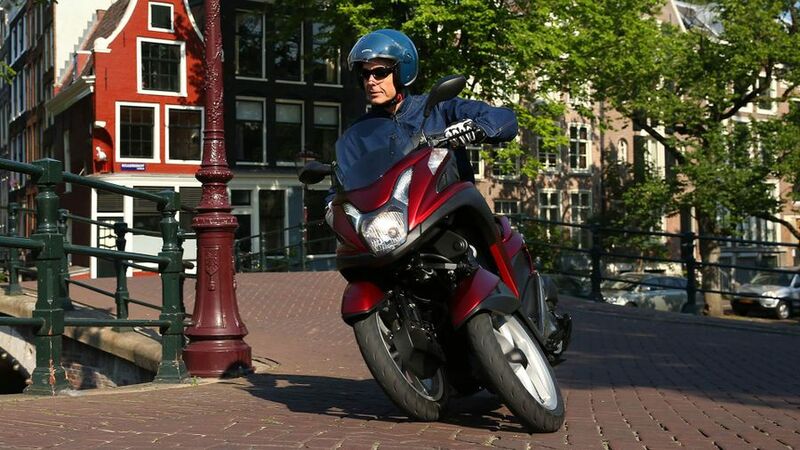 The Tricity is neatly styled, and in many ways its extra front wheel is an attractive talking point. It’s only a humble 125cc scooter but it looks good and it incorporates innovative, impressively efficient technology, so what’s not to like?